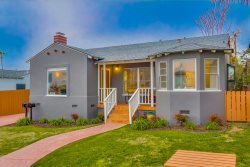 Ocean Views, Indoor Outdoor Living, Steps to Sunset Cliffs and Nice Cafes W/ Central A/C! Combine this property with Seabreeze Retreat to sleep up to an additional 6 creating a 7 bedroom 4 bath compound / beach estate. Hidden Beach Oasis is the perfect getaway Sunset Cliffs vacation rental! This 5 bedroom 3 bath modern beach home has views of the ocean from the kitchen, front deck space, Master Bedroom and Back bedroom. Sun filled living room and dining area seats your entire group with room to spare inside and out with the Pacific Ocean Breeze at your doorstep. All beds have luxury Serta, Sterns and Foster, or Tempurpedic mattresses to ensure a good nights sleep. The contemporary architecture and spa like design elements feature an outdoor shower, hardwood floors, high ceilings, stone bathroom, glass showers, chef inspired kitchen, Central Air Conditioning and large pantry filled with nearly EVERYTHING one might need to enjoy a perfect meal on vacation. The clean lines and open floor plan connect outdoor and indoor living spaces, creating a wonderful flowing environment to entertain guests or to relax and enjoy the quiet peace of your home. Ocean views from the deck, living room, kitchen and two of the five bedrooms. This Sunset Cliffs vacation rental is very kid friendly with durable and plentiful kitchen items, toys, 2 pack and plays, co-sleeper for bedside feedings, 2 high chairs, baby blankets, children's books, games, body boards, beach chairs, umbrellas and much more. Meal time? The updated Stainless Steel kitchen and open floor plan allows you to cook while entertaining so you are not separated from others. Eight to ten bar seats at the counter to show off your skills! Large loads of laundry? There is an oversize washer and dryer available for use to keep your clothes fresh and ready for the day. Lazy day? Enjoy Netflix, Pandora and other WiFi enabled programs on 4 flat screen TVs' with Smart-Hub technology. Kids on vacation can sometimes feel bored? Not here! Explore the cliffs, and when at home, avoid the tv with a plethora of board games, books and Lego. If heading to the beach, enjoy beach toys, 2 boogie boards for some fun in the water and 4 beach chairs for relaxation in the sun. Beach towels of course are provided as well. Total 8 adults 4 Children, or 10 Adults. 5 Star: Amazing house. Lisa is incredible to work with. You will want to trade in your mattress at home for one of these at this gorgeous house. There is everything you could need and the toys for kids are such a plus. The deck is fabulous and the home is so clean and classy. I was most impressed with Lisa. She really is amazing and so easy to work with and understanding. I would give her 100 stars. This was a fabulous home with amazing beds, everything you could need as far as kitchen supplies, towels and extra fun things. Its extremely family friendly and we will definitely be back! !